In stock -This product will ship today if ordered within the next 4 hours and 17 minutes. Green, unroasted coffee beans are the basis for this unique drink and give it its special aroma. 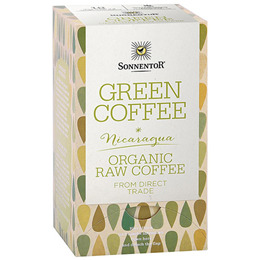 A bright green colour in the cup is as surprising as its fresh, earthy flavour. This drink gently revives the senses and is particularly suitable for those who focus on mindful and reduced eating. Enjoy this drink post exercise or after each meal. Ingredients from certified organic agriculture: green coffee (Arabica highland bean). Green coffee is prepared like tea. Pour approximately 200ml of boiling water over a green coffee bag, steep for 2-3 minutes and the drink is ready for your to enjoy. 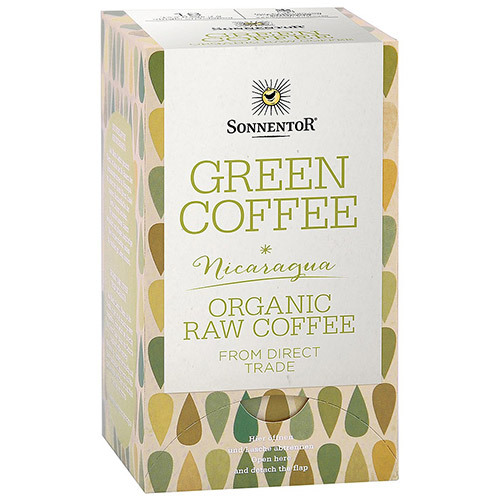 Below are reviews of Sonnentor Green Coffee - 18 Coffee Bags by bodykind customers. If you have tried this product we'd love to hear what you think so please leave a review.